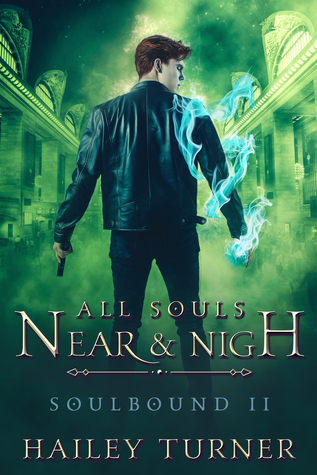 Today Kris and Jay are back with their review of All Souls Near & Nigh, the second book in Hailey Turner’s Soulbound series. Check out their chat about the book after the summary below. 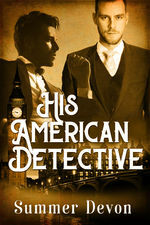 Special Agent Patrick Collins is now working in New York and living with his werewolf boyfriend, Jonothon de Vere. The two men are now soulbound and navigating being a new pack of two, on top of figuring out their personal relationship. But that is not all that the men are dealing with, and no sooner does Patrick return home from a case, but he is called into another one. This time there is a turf war between the vampires and the werewolves in the city, along with in-fighting between the various supernatural groups. On top of that, a vampire drug called shine is making its way onto the streets and werecreatures are showing up dead and injured. As Patrick and Jono begin to dig deeper into the case, the men find themselves right in the middle of the conflict. Soon they are navigating hostile vampires, vengeful gods, violent attacks on werecreatures, and wolf pack politics. As the situation gets more dire, the men find their lives are on the line, but they are determined to help sort out the conflict before things get even more out of hand and the city falls to pieces. Now Patrick and Jono must rely on their own strength, as well as the bond between them, in order to get out of the situation alive. Kris: Okay, so unsurprisingly I loved it! LOVED! I loved the way Turner weaves all the religion and mythos into the world so seamlessly. 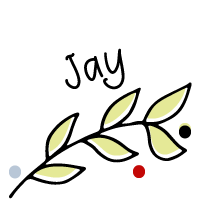 Greek, Norse, Aztec…it’s all there without feeling like it’s too much. At least for me. I can understand how some people might find it a tad overwhelming though. I have a good grasp of all the mythos to begin with, so that helps. But if someone is a complete novice, it might be a bit much and slow things down. For me, I was right there with everything, and thought she did an outstanding job of giving enough information without it being too much and info dumpy. Jay: Yes, agreed. As you know, in the first book I found myself a little overwhelmed with the mythology because it’s not something I know a lot about. But in this book I had far fewer issues. I am not sure if that is because things were less complicated, or I just got more comfortable with who everyone was, but I definitely felt like it was easier to follow. Jay: Agreed on the dragon! That was so cute! I love when shifters have animal traits in their human form and this was such a fun little touch. I will also second what you said about the mythology. I really appreciated how Turner incorporates a variety of pantheons. Not just Greek/Roman, but also Aztec and Norse. It is not something you see a lot and I appreciate the diversity of cultures represented. Kris: Absolutely. Religion and belief is a big theme in this book, and she handles it with deft skill, incorporating so much and giving it a lot of diversity. This did not fall into the book 2 slump that so many series have. It wasn’t just a pass onto the rest of the story kind of book. It had a solid plot and moved things forward. Jay: Agreed, sometimes there is a sophomore slump, but this book expanded on the world building and the politics, in addition to giving us a new story. Kris: Yep! Which leads right into Jono, and how he’s stepping up. I thought that it was perfect. Organic and real. For who his character is, and for what is going on. And his bond with Patrick. It all makes perfect sense for what he’s building, who he is, and where the story is going. And I think Turner did an exceptional job tying the two storylines together. It felt seamless. Jay: Yes, I think that was well handled. We are seeing growth from Jono, and obviously we are leading up to something bigger for him, and we get just the right amount of forward movement here on the larger series arc. I like seeing Jono start to come into his own and not be so isolated. He has a real pack now and clearly he is growing into a leader. Kris: Exactly. Even though it’s a long book, the pacing was great. Nothing lagged and everything moved forward, every character growing, but especially Jono and Patrick. Jono showed us hints of that in the first book, and now we’re really seeing him be himself and not being afraid to be who he is and do what is right. Jay: Yes, and the larger political picture is really interesting here. I like to see how the vampires and wolves maneuvered, the different packs, and the larger political landscape of all the supernaturals. Kris: There’s a very solid hierarchy and order to the way supernaturals work in the world of the mundane and the way the gods influence things. You know how I feel about world building. and it’s no secret that I think Turner excels at it. But it is completely outstanding here. Everything falls into the rules of the world that’s been built, and I absolutely love that. And it’s just so dang interesting. The way each god influences the world and yet doesn’t get too involved. The way each type of creature has laws and rules they must follow. It’s intricate and compelling. Jay: Yes, creative world building is such a thing for me too. I am always looking for unique spins and I think this world is so well developed. Not just the world of the supernaturals, which I think is done with a lot of creativity, but also the way the gods are incorporated as well, which is so unusual. Kris: Incredibly unusual. We so rarely see that. If gods are involved, it’s usually just one, or one pantheon. I love the way she shows so many different gods, that they act and react the way they should from legend, and really shows that it’s the diversity of the people that make it possible. That there is no one right way to worship anything. I mean, of course, except being malevolent. Kris: That’s a thing that really stuck with me. Well, and also agent pretzel, lol. Ok, so the relationship. Again I think we got some nice progress here. I like when I series moves forward enough to see relationship development, but also gives us a bit more each book. The twist at the end of the last book really sets these guys up well here and I love them together. Kris: Yes! I was going to say exactly that. After what happened in June, these guys are navigating in uncharted waters. And they are really finding their own, dealing with what they now have and how that pertains to each other. I think that they really made some progress in their relationship and the way they relate to each other, but that there’s still work to do, and I love that they both know that and want to do it. Jay: Agreed. They are committed to their relationship and figuring things out. I also really appreciate the balance to these guys. They each are strong in their own ways, they each have power, and it gives a nice dynamic to their relationship. They can support one another and be there for each other and stand on their own. Kris: Oh definitely! I’m a big fan of the way they have to figure out that they need to rely on each other more. They are both so independent, though Patrick is more so. But they are figuring out they are stronger together, more than the sum of their parts. That doesn’t mean it’s easy, but they are working on it. Jay: Yes, they still both have the “step into danger” issue. But they are getting more used to relying on each other. Kris: Yep they sure do. Both willing to throw themselves on the blade to save others. Can I also say I love the way Turner ties each book up, but also makes it clear what’s coming next? Or at least the direction they are going. It’s not a cliffhanger, but close. Jay: Yes, I think it comes together well here, but we know things are building up for more. Jay: Anything else you wanted to mention? Kris: All in all, I was really pleased with this book. I mean, I knew I’d like it. But I was impressed with how well everything came together and how far the plot moved forward. I can’t think of anything that wouldn’t be a spoiler. Heh. We don’t want to spoil! Jay: OK, so I rated it a 4.5. I found it exciting, with great world building, and really engaging. My only tiny issue is it felt a little long and a few parts I could have used a little trimming. What about you? Kris: 4.75. It was nearly perfect for me, having everything I love about supes, magic, worldbuilding, and relationship. I was captivated. Jay: Yep! This is so up your alley! Jay: Ok, so I think we are set yes? I am really looking forward to seeing where things go from here. I think the set up for the next book is really interesting. I can’t wait to see these guys grow both in their relationship and in terms of their place in the supernatural world. Kris: Yes, me too. It’s going to be spectacular. I’m especially interested to see what Jono does about the god pack. That’s going to be epic I think. But I really want to see what the end game is with the Dominion Sect. What’s gearing up? Especially with the artifact that was taken. 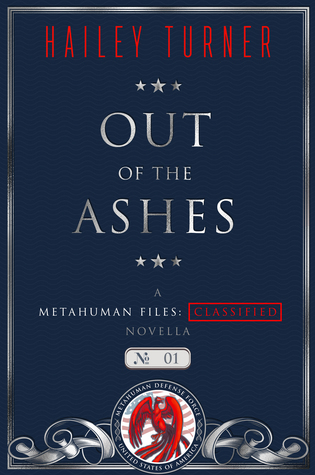 Jay: Yes, they were kind of on the back burner this book. There, but not as prominent. But clearly there is more coming for that part of the storyline. And yes, for sure I am curious about how things develop with Jono. There are big things for him I’m sure. Jay: Me too! Ok, so that about wraps it up. We loved it and we want more!